In the longer-term, African countries need to spur economic diversification and industrial development. An old adage suggests that one should never waste a good crisis. This is particularly pertinent advice for African economies reeling under the effects of the current commodities crisis, which may well turn out to be an opportunity, especially for larger African economies that have been dependant on oil revenues, to put in place the conditions needed for economic diversification. Diverse economies are more resilient and less vulnerable to external shocks – in other words, the feast and famine syndrome associated with commodity dependency. Standard Bank CEO Sim Tshabalala argues that the continent is several steps down this road already. ‘The steps that Africa has taken to get its house in order – improved governance, major regulatory reforms, better education and healthcare – are reaping rewards independent of commodity prices,’ he says. Some commentators go even further. Director of the Brookings Institute’s Africa Growth Initiative Amadou Sy contends that the recent external shocks – the slowdown in China and falling commodity prices ‘actually provide opportunities for implementing sound and often innovative policies for maintaining future growth’. These changes are the deep structural reforms that development economists have long advocated. Rand Merchant Bank head of country risk Ronak Gopaldas points out that the last time commodity markets tanked – in mid-2008 – the crisis was short-lived. ‘Recovery was swift,’ he says. ‘So there was no need to diversify economies.’ However, this time around, there is no doubt that low commodity prices will be a factor for a lengthier period. The necessary structural reforms have been long known and movement from primary activities (mining and agriculture) to an economy based on secondary (manufacturing) and tertiary (services) activities has long been the holy grail of African development. This was the path taken by countries that have advanced from poor to medium or upper income status. Sy describes fully commercialised (as opposed to subsistence) agriculture and manufacturing as the ‘growth engines’ that African countries need to develop. To do so, they have to raise more investment locally (including taxes), clamp down on corruption, improve health and education services and – in most cases – reduce the costs of government, especially as they impact on doing business. These are what economists are referring to when they talk about ‘structural reform’. This time around, the depressed prices are likely to be with us for some time. In February, IMF MD Christine Lagarde warned that ‘not only have oil prices fallen by around two-thirds … but [longer-term] supply- and demand-side factors suggest that they are likely to stay low for an extended period’. This is a genuine short-term crisis for Africa’s eight oil-exporting economies, including the continent’s largest, Nigeria. Until recently, the country’s oil and gas sector accounted for approximately 35% of GDP and 90% of petroleum export earnings. With the much lower oil price likely to prevail for at least the next year, Nigeria faces a fiscal gap – meaning that the government will be unable to meet commitments, such as the wages of public employees, including medical staff and teachers. The shortfall has been calculated at US$15 billion. Nigeria has already arranged with the IMF, among others, the bail-out it needs to keep the lights on. One of the reasons this was relatively easy is the new Buhari government’s reformist stance and commitment to diversification. Tshabalala points out that Nigeria in fact plans to spend more than it has previously, but intends doing so more efficiently. ‘Crucially, this is to be funded by improving tax collection, cutting government costs and clamping down on corruption,’ he says. Of course not all of Africa is commodity dependant. 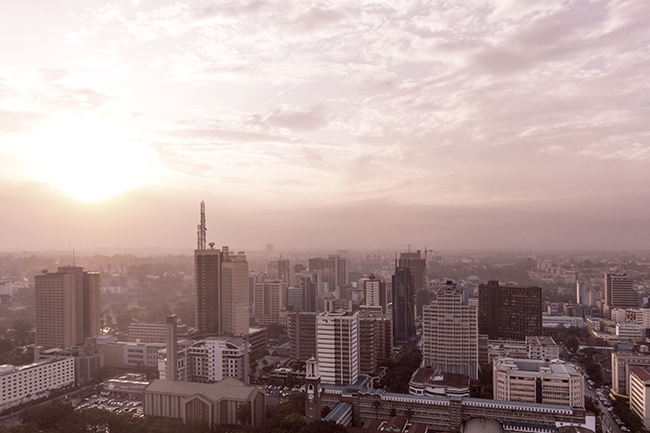 Kenya’s economy is based on agriculture and tourism, so the drop in commodity prices – especially oil – is actually good news for the country, where development with market-driven diversification is proceeding at an impressive rate. Prior to the decline, oil accounted for about 40% of Kenya’s imports. Against that benchmark, the lower price is now saving Kenya some US$1 billion every year. This is money freed up for investment in the country’s booming property market as well as productive investment in the information economy. Landing the Seacom fibre-optic cable in 2009 linked East Africa to Europe and Asia. An additional cable, the East African Marine System, now links Kenya to the UAE. The information and communications technology space offers the biggest, yet to be used, opportunities in East Africa. It has been estimated that mobile phone penetration in Kenya is more than 80% and internet penetration is 64%. Technology reaches 29.1 million individuals, making Kenya the 21st most-connected population in the world. Kenya is of course renowned for one of the most innovative digital products in any developing economy – the M-PESA mobile telephony payment system – launched in 2007 by local company Safaricom and operated though a network of 40 000 agents. It’s estimated that more than 40% of the country’s GDP flows through the M-PESA system. The Economist magazine notes that ‘paying for your taxi ride using your mobile phone is easier in Nairobi than it is in New York’. Tshabalala observes that ‘Nairobi is looking like an increasingly serious rival to Johannesburg as an African headquarters for multinationals and as a financial centre’. M-PESA has been rolled out elsewhere in Africa – Tanzania, South Africa, Mozambique, Lesotho and Egypt – as well as other developing countries including Pakistan, Bangladesh and the Philippines. However, in none of these countries has take-up been anywhere near as spectacular as Kenya. Elsewhere in East Africa, the technology revolution is also having a big impact. Another country with limited natural resources, Rwanda, has created SEZs for technology development, and manufacturing has attracted recent investment from Cisco Systems and Ericsson. The latter has entered into a partnership with the government of the country to implement SMART Rwanda – an initiative intended to make the country the ICT hub in the region. The growth and consequent diversification of the East African economies has lessons for the rest of the continent. Diversification only happens if it is market driven. The biggest problem that has historically faced resource exporters – and not only in Africa – is the so-called Dutch disease. It was named as such for the problems that the Dutch economy encountered when the country started to export North Sea oil in the 1970s. As a country exports more minerals, so its currency appreciates. However, a strong currency makes its manufacturing uncompetitive. Currency depreciation is not a silver bullet but, as Tshabalala remarks, ‘it has its advantages’. He says that while the middle class feel the pinch with foreign travel and purchasing luxury goods, ‘if appropriately managed, depreciation supports national competitiveness and makes structural reform easier’. Industrialisation requires effective import substitution, not of the state-driven variety that so dramatically failed in Latin America in the 1960s and 1970s, but a market-driven variety, involving the continent’s large-scale entrepreneurs. The most famous of these is Aliko Dangote, the man behind West Africa’s largest conglomerate. Dangote has interests in sugar, cement, flour and, more recently, oil and soft drinks. Said to be the continent’s richest man, he heads an 11 000-employee organisation that has the resources to invest if opportunity opens up. The current crisis may provide such a space. In March, Dangote opened a US$20 million tomato paste factory in Kano, northern Nigeria. The country is the world’s 14th largest tomato producer and eighth-largest importer. The space for this development was created by the devaluation of Nigeria’s currency, the naira, a year ago. There is currently room for further devaluation as the naira is known to command a better dollar rate in the informal market than the legal one. This is where the management of political expectations is so critical. ‘Defending the currency’ – in other words maintaining at an artificially high level by spending a country’s foreign reserves – is not sustainable. Tshabalala points out that since devaluation, Nigeria has already spent 2% of its foreign reserves shoring up the naira while another oil exporter, Angola, has spent even more (6% shoring up the kwanza). African countries are becoming increasingly differentiated and some can be expected to diversify, not overnight but incrementally. Those that do will be those that shake off the complacency that comes with resources wealth and that facilitate investment opportunities for a profit-seeking private sector. In this context, a sense of crisis is a good thing.